Aw Spring! The time of year where pink and purple girls and boys can be spotted walking through Sproul plaza, when that Bollywood song is stuck in your head all day, when….not your typical spring associations? Well then you are missing out! Holi began in India as a celebration of the triumph of good over evil. According to Hindu tradition, there once was a demon who began to terrorize the three worlds. Being a typical demonic punk, he threatened the god Vishnu who had earlier destroyed his other demon brother in battle. However, the demon’s son, Prahlad, was despite his demon family tree, a devotee of the good Vishnu. Furious at his rebellious son, the demon asked both his demon sister and his good son Prahlad to sit inside a fire, in order to prove that Vishnu would not protect them. Well, as the story goes, Vishnu stuck by his main man Prahlad, but let the demon sister burn. Holi is the celebration of the burning of the dishonorable sister, and the rescue of the brave son. It is a celebration of life and rejuvenation, which UCB takes part in every year. Our annual Holi festival is taking place once again in lower Sproul this Saturday April 14th! 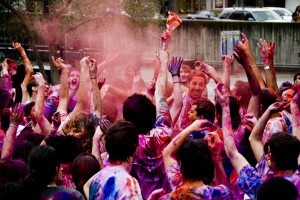 During this yearly ritual students of all cultural backgrounds get together to fill the world with color. What do you need to participate? 1. Old clothes (leave Marc Jacobs and your other designers at home. They are the only guys not invited to the party) 2. Colors! You can purchase your very own powdered colors at the event for 2 dollars, or (like we did) find them at a wide variety of locations in Berkeley for even cheaper. 3. A fun attitude! (Spring has come! It is a time to rejoice that April showers will soon come to an end, and that the trees on campus are in full bloom, NOT a time to be the Holi grouch and complain about upcoming finals). Holi has become a world-wide practice. It is a time to get together, dance and throw colors at each other until we all become one big spring-colored mass. It is a great way to ring-in the final weeks of the school year, and for those of you who are graduating, the start of your new life.